If you have a lot of guests to serve, you can save several hundred dollars by renting a faux showpiece cake from a number of locations for $75 to $100 and then just serve an inexpensive sheet cake instead (a half sheet cake from Sam’s Club will serve 40 people at a cost of a mere $1.15 per slice). Choose between multiple designs for your faux cake to match your wedding theme, with the plain white circular or square cakes being the most popular, allowing the bride to decorate in her own style with fresh flowers or ribbon. Can’t bear the thought of not having a cake-cutting photo op? Just fake it with the showpiece cake while using two slices of real cake for the bride and groom to feed each other. Or, if you must actually slice into a cake,your bakery can typically substitute the top layer of the showpiece cake with a tier of real cake for approximately $75-$100. Whole Foods provides an economical option for wedding cakes as well. A three-tiered wedding cake consisting of one 6-inch, one 8-inch and one 10-inch tier in any icing or filling combination offered will feed approximately 80 to 100 people and costs between $100 and $200. Another option is to contact local culinary schools where pastry students are getting hands-on, supervised experience, so the bride receives a discount from traditional bakery prices. Depending on the filling or type of cake requested, prices per serving for a tiered wedding cake through many local Culinary Arts Program begin at $3.50. If you’re determined to go the cupcake route, just go grocery shopping. White or chocolate cupcakes from Sam’s Club with a choice of whipped buttercream icing in vanilla, chocolate, German chocolate or cream cheese cost a mere $1.49 each. The cupcakes are decorated with roses, or the bride may consult with the bakery for other ideas. OYou can even enlist Betty Crocker and a group of your best baker friends to make homemade cupcakes. Dress them up with elegant Bella Cupcake Couture wrappers available online at a cost of $48 per 50. After factoring in baking supplies, your homemade creations will cost even less than that $1.49 price. Would you consider renting a wedding cake for your wedding? < Previous Would you donate part of your wedding budget to help victims of Haiti? I agree with the post… a wedding is a wedding, and it should be nice, as it is your most precious day in life. However, I believe that nowadays couples can be virtually overwhelmed with the cost of a wedding. “traditional” rule was that couples used to get married at a comparatively early stage in their lifes, starting off their life together at a point where financial dependency to their parents was often the rule. This, however changed over the past few decades. Nowadays, couples often not only get married at a later point in their lifes, but also at a point where they are financially secured enough to cover their own wedding expenses. Another reason why the traditional “wedding etiquette, who pays for what” changed – at least if we want to believe polls asking “newly-wed” couples – is that more and more couples nowadays want to have their own “say” in the wedding. From the guest-list to the menu, from the flower bouquets to the wedding cake … should the wedding have classical music, or the couple’s most favorite local band … should we really invite uncle Graig, who never agreed to our wedding to begin with ? I really believe that the topic of wedding etiquette is a truly wide minefield; in order to comply with today’s “correct” etiquette, one has to do some serious research – but this blog is a great starting point in my opinion… thanks a lot for this blog – it is great for soon – to – be brides and grooms! 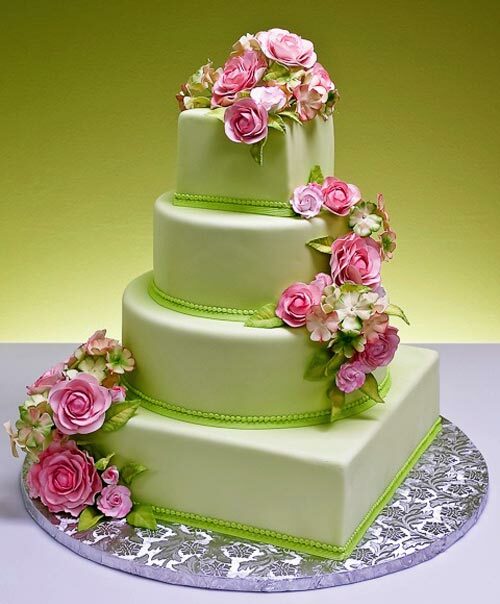 What a lovely and gorgeous cake for weddings. Thanks for sharing it.